Chicago O’Hare Terminal 1 | ride. travel. live. This is the airport everyone loves to hate, along with the usual suspects (Heathrow, Paris Charles de Gaulle, etc.). I’ve had my share of delays and cancellations and overnights at O’Hare in the past, but here’s the bright side, it’s a treasure as far as airport architecture goes. 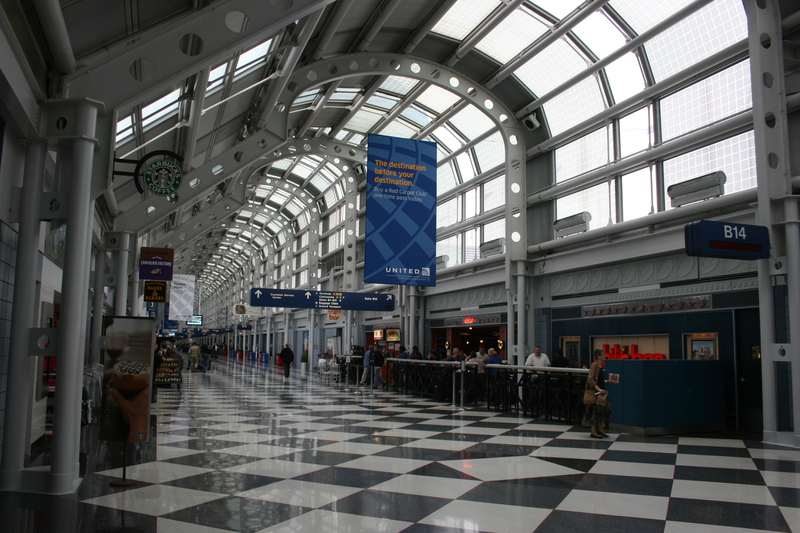 The best of them is the Helmut Jahn-designed Terminal 1, the United terminal, completed in 1987. 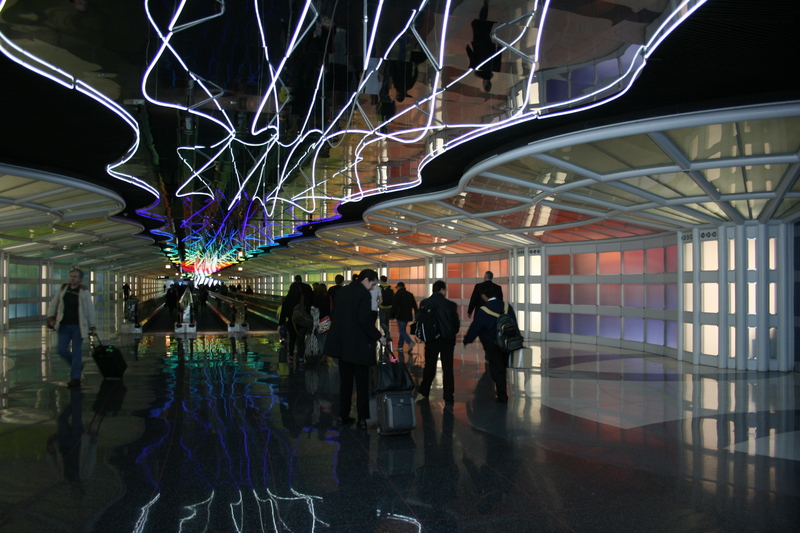 Jahn left his mark on the airport, also designing the CTA subway station, which is a masterpiece in its own right. The United terminal is the modern equivalent of the old train stations of Europe, and it’s clearly inspired by the exposed steel beams, screws, and arches. He didn’t match the rest of the airport’s architecture, an understated Miesian steel and glass box, but departed boldly from it, presenting a structure close in spirit to his downtown Thompson Center. Nevertheless, he integrated it into the remainder of the airport, giving a hint in Terminal 2 with a redesigned entryway to the gate area, and the connector corridor between Terminal 1 and Terminal 2. 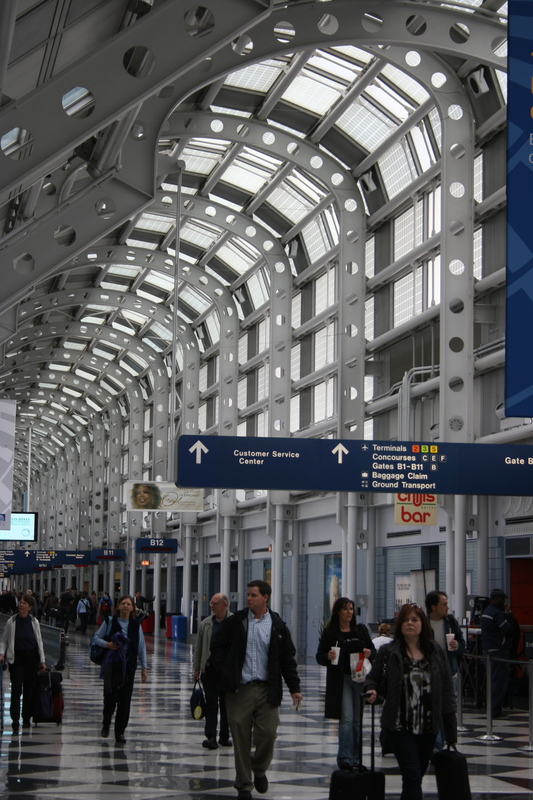 The terminal has also weathered the intervening quarter-century, hundreds of millions of passengers, Chicago’s notorious weather, and is a beautiful and practical structure, in the best tradition of Chicago architecture. My favorite part, though, is the tunnel linking to the satellite concourse C. It’s a 1980’s period piece, complete with the pastel color scheme and the kinetic neon sculpture. The only thing that’s been recently missing is the matching music (to Gershwin’s Rhapsody in Blue). Airports tend to be so colorless and bland, what’s wrong with a few wacky colors to lighten things up, especially when you know your plane won’t be departing on time! 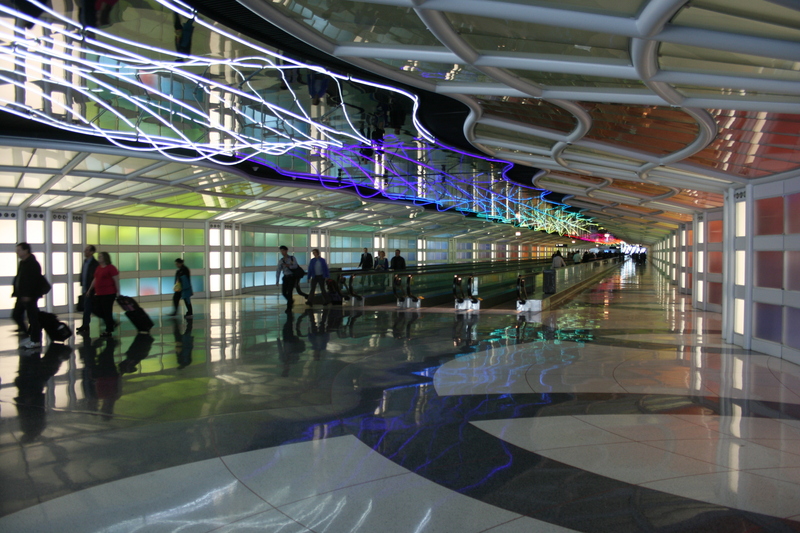 So unlike most, I always look forward to some time spent in O’Hare.